A short snippet of Injustice 2 gameplay has leaked online that shows Batman’s eternal nemesis, Joker, in action. 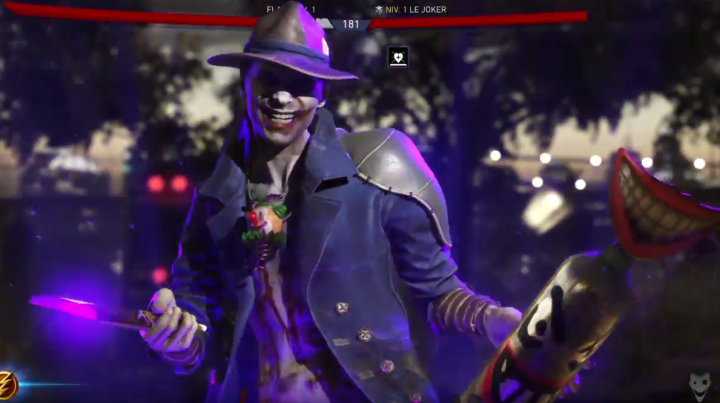 The footage, which you can see for yourselves here, has the Clown Prince going up against the Flash, with various combos being performed in order to give fans just a taste of his abilities and playstyle. Adding to that, a small selection of images have surfaced over on NeoGAF (via IGN) that show off two markedly different looks for the murderous prankster. Check them out below. Today’s leak follows that of the beat ’em up’s achievement list spilling out earlier this week, itself having let slip that Joker would, in fact, be returning for the sequel, despite a version of him having been knocked off at the end of the original. But hey, infinite universes make anything possible, so you can probably expect the presence of this particular Joker to be explained away as being from an alternate one of those. That would certainly explain his new look, which has unmistakable shades of Jared Leto’s portrayal of the character in Suicide Squad. NetherRealm has yet to officially confirm Joker, but with a new character announcement set to arrive tomorrow, it’s looking likely that he’s next in line to be given an official spot on the game’s roster. Besides that, there appear to still be 10 character reveals left to come before Injustice 2 hits retail on May 16, but which DC hero or villain are you still hoping to see announced ahead of the supercharged brawler’s release? Let us know in the comments below!